Their findings were published on August 14th in Scientific Reports. Upper-level observations such as radiosondes in the Arctic can help to forecast mid-laitude extreme events. Impacts of the Arctic observations can transfer via the tropospheric polar vortex, which is massive low-pressure air mass over the Arctic or Antarctic regions at about 10-km altitude. The tropospheric polar vortex sometimes extends toward mid-latitudes accompanied with meandering of mid-latitude westerly jets. This extension can occur even in summer: in August–September 2016, the meandering and extension were relatively active among the recent years. Thus, the impacts of the Arctic radiosonde observations could influence the mid-latitude extremes, the courses of three tropical cyclones approaching to Japan or Northern U.S. and Greenland, since the impacts transferred trough the extended tropospheric polar vortex. For the study, the researchers performed weather forecast experiments for three tropical cyclones that occurred over the North Atlantic and North Pacific during 2016, to determine whether additional observations could help predict their paths and intensity more accurately. 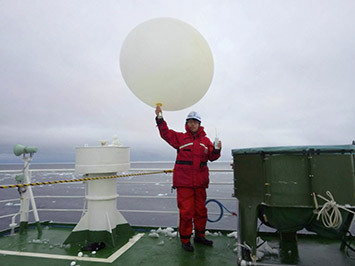 To supplement existing weather data observations, additional observations were conducted using weather balloons released from ship- and land-based weather stations based in the Arctic. 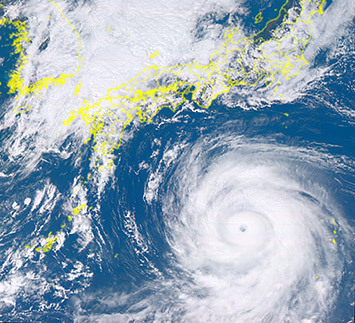 The data were analyzed using a data assimilation system developed in Japan Agency for Marine-Earth Science and Technology, which can produce reanalysis datasets by “mixing” (assimilating) observations into global atmospheric conditions: the system was indispensable for the forecast experiments. The additional observations improved the predictability of the cyclones, allowing the scientists to track the paths of the cyclones as well as forecast their intensity more accurately. "This study demonstrated the usefulness of additional Arctic observations for mid-latitude numerical weather forecasts for tropical cyclones," said co-author Jun Inoue, an associate professor at NIPR.